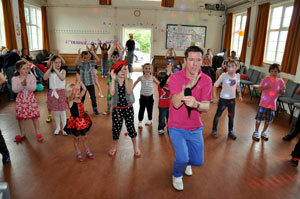 All of our parties are filled with a mix of the latest pop chart hits and fun filled, high energy party games. We always ask for a favourite songs wish list and games and themes are always suited to the age group. Richard will lead the way and join in with the latest dance routines! Richard's likeable personality creates a cheerful party atmosphere making sure the BIRTHDAY STAR has a memorable day. Richard Welsh is a professional DJ/ entertainer and is 100% reliable, friendly and approachable. We will contact you 5 days before party for peace of mind. All effort is made to make sure your Birthday child and friends have a memorable party. We carry public liability insurance [£2m], all equipment is PAT tested and staff CRB police checked. A majority of bookings come from recommendations - see our testimonials on the thank-you page. 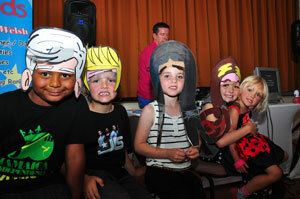 Why not add a themed party to your celebration? Richard will adapt the music and games to go with the theme. The popular TV show is back now with 3 new judges! 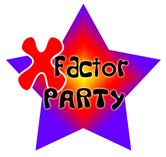 Our X-Factor themed parties have been one of our most successful party options. New cartoon wigs have been added for all the judges. Just like the TV show – the singing stars will sing their favourite songs. Then they face the views on the panel of judges with themed music and sound bites. Everyone gets a chance to join in the fun as singers & judges are changed after each performance. Be the talk of the playground with this children’s favourite party theme! We are also open to any other ideas you or your child may have and will adapt music and games to a theme of your choice. Once your party details have been confirmed, a booking contract is sent to you for checking and signing, along with a pre-paid envelope for return. Richard will also contact you a few days before the party to run through final arrangements and to confirm the number of children and any special requirements. 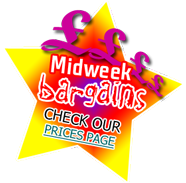 See Options and Prices for further details. "He had the children spellbound with games and fun activities for hours on end. It left us parents with little to do but just sit back, relax and enjoy the day"
Important Info: Richard Welsh is CRB checked, all equipment is PAT tested and he has Public Liability Insurance for £10,000,000.